From all-new airliners made by Russia and China to a trio of twin-aisle jets from Boeing and Airbus, 2017 will bring an unusually large batch of new airplanes. A330neo: Airbus is expected to fly its A330neo next year. Neo stands for "new engine option." The A330, a two-decade old design, is getting a makeover with new engines and new wingtips to boost its range and fuel efficiency. Airbus is positioning the 'neo' as a lower-cost alternative to Boeing's advanced 787 Dreamliner. The first of two planned models will fly next year and enter service in early 2018. A321neo: The second member of Airbus's revamped single-aisle family, the A321neo, will enter service in 2017. It's the largest member of the updated A320neo family. Airbus hopes the jet, which seats up to 240 passengers, will replace the out-of-production Boeing 757, an aging transcontinental workhorse for U.S. airlines. Airbus has a significant sales lead with the A321neo, and Boeing is considering new designs to keep its customers. A319neo: The smallest member of the A320neo family is expected to fly for the first time in 2017, but demand for it isn't great. The smallest offerings from both Boeing and Airbus have received few orders because airlines are opting for larger and more fuel efficient models. A350-1000: The A350-1000 made its first flight in Toulouse, France in late November, and Airbus has been accelerating its testing of the plane. The 366-seat long-range airliner is the biggest twin-engine jet Airbus has ever designed and is the second member of the A350 family. It is trying to supplant Boeing's best-selling twin-aisle airliner: the 777-300ER. Airbus is slated to deliver the A350-1000 to Qatar Airways in late 2017. 737 Max 8: After five years in development, the first 737 Max will be delivered to Southwest Airlines in the first half of 2017. Boeing's fourth-generation single-aisle plane has two new engines and a new tail section and winglets -- designed to cut fuel consumption by 14%. The Max 8 is the first of four 737 Max models Boeing is designing. Boeing has thousands of orders for the 737 Max, including from China's fast-growing airlines. 787-10: Boeing will take its new 787-10 Dreamliner on its first flight in the spring. The 320-seat airliner, made mostly of fiber carbon, is coming together inside the company's plant in North Charleston, South Carolina. It's the first time the new factory has exclusive manufacturing responsibility for a new Boeing model, a sign of its growing importance for the company. The 787-10 won't fly as far as its two smaller Dreamliner siblings because airlines preferred fuel efficiency over range. 737 Max 9: Boeing will soon follow with the 737 Max 9, the largest member of Boeing's updated single-aisle 737 Max family. The jet is slated to fly for the first time in 2017. The first test aircraft's fuselage arrived at Boeing's plant in Washington state in late December ahead of final assembly. The aircraft can seat up to 220 passengers in a single class and is Boeing's direct rival to the A321neo. C919: China's first big airliner will be flown in 2017. The Comac C919 is aimed to compete with the Boeing 737 and Airbus A320. Earlier this week, Comac cleared a hurdle when its engines -- made in the U.S. and France -- were approved by U.S. and European authorities. The aircraft was originally supposed to fly in 2014, but the project has been repeatedly delayed due to China's relative inexperience in developing commercial airliners. Comac isn't expected to go toe-to-toe with Airbus and Boeing yet, but through partnering with western suppliers, China is cultivating itself as global contender for the next generation. MS-21: Russia's United Aircraft Corporation is getting ready to fly its all-new Irkut MS-21 in 2017. 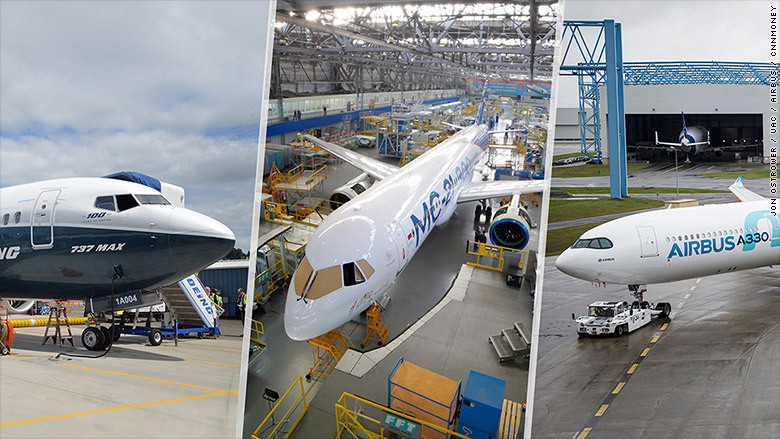 The project is backed by Russian President Vladimir Putin, who wants to elevate the country's commercial aerospace industry to complete with the Airbus and Boeing single-aisle jets that dominate routes across the world. E195-E2: Brazil's Embraer (ERJ) is deep into aerial testing of its heavily revamped E190-E2 airliner, a version of which flew for the first time last year. The second member of the E2 family, the E195-E2, will fly for the first time in 2017. The jet is the largest airliner the company has ever developed, seating around 132 passengers in a single-class cabin. The E195-E2 competes with Canada's all-new Bombardier CS100, which started carrying passengers in July.